According to Jewish tradition, all trees share the same birthday on Tu B’Shevat. Although it's a lesser known holiday, observance of Tu B'Shevat is growing due to the rising importance of Earth stewardship. Families can celebrate by enjoying any number of activities. 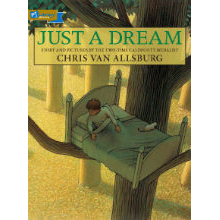 Pick up your favorite book about nature, trees, or caring for the environment. 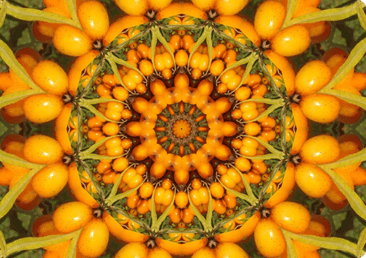 You can see our list of Tu B'Shevat selections here. On the Jewish New Year of the Trees (Tu B’Shvat), a little boy shares his hopes and wishes for trees—and especially for the one under which he plays. 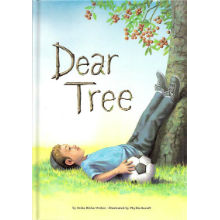 With rhyme and colorful illustrations, this book tells the story of a boy and his family who plant a tree in honor of the Tu B’Shevat, the Jewish holiday known as The Birthday of the Trees. 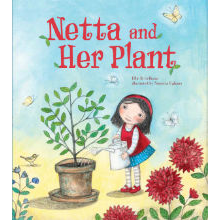 The plant that Netta received on Tu B’Shevat is growing — and so is Netta. In fact, soon it will be time for the plant — and Netta — to do new things. Growing bigger is intimidating, but it’s also wonderful. What would happen if we never stopped to care for our planet? Walter has a dream -- or maybe it’s a nightmare! -- that imagines such a world, just in time for Tu B’Shevat. 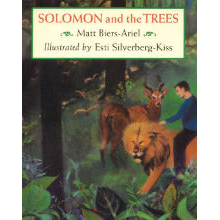 According to this midrash, when Solomon was young he used to spend his days in the forest with his dear animal friends. Once he became king, however, he forgot how important it was to take care of the earth. In this story, he is reminded to take careof the world around him. If you received a Family Tree decal in the mail, Tu B'Shevat is a perfect opportunity to talk about your family story while playing with the decal. For more Family Tree ideas, visit our Pinterest board. 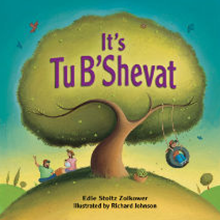 Have a family dance party with our special Tu B'Shevat playlist. 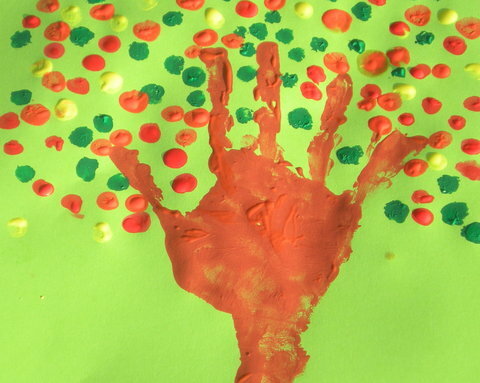 This fun (and somewhat messy) hand-painting project from ChallahCrumbs.com will “blossom into a beautiful tree” for Tu B’Shevat. “Tu B'Shevat is all about appreciating trees, and one of their most wonderful gifts to give people is fruit,” says Kveller.com. To symbolize that appreciation, follow these directions and make a beautiful centerpiece made of fruit. Use our special Tu B'Shevat Meal Plan to find fast and fun recipes to learn with all your senses. Don't feel like cooking? Try cream cheese and fig jelly on whole wheat bread—a quick and yummy Tu B'Shevat themed sandwich. Find and support a charitable organization that plants or cares for trees. Is it still wintry and cold where you live? Don't worry—there are lots of great indoor activities that will help you start a garden. Shalom Sesame has a fantastic Tu B'Shevat playlist that features videos like this one.